This article is about the amiibo-based board in Mario Party 10. For Mario's board in the original Mario Party, see Mario's Rainbow Castle. The Mario Board is a board that appears in Mario Party 10. It is available exclusively in the amiibo Party mode, where it can be played on when the Mario amiibo figure is scanned on the . Like the other amiibo boards, the Mario Board is based around a certain character, in this case Mario. The board is based on the earlier levels from the 2D platformers (most notably World 1 from New Super Mario Bros. Wii). The board is covered by Goombas, Koopa Troopas, Blocks, and rolling hills. A decorative stand depicting part of a level from Super Mario Bros. appears in the top-left corner. Here, players can hit a ? Block to get an item. Known items include Coins (which are used to purchase Stars on the board), Super Mushrooms (to steal coins from opponents), and Mega Mushrooms (which grow the players in size to tip over opponents and steal coins from them and collect coins on the path). 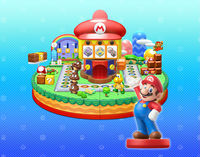 Three models resembling Mario also appear on the board, which depict different Dice Blocks, which when landed on, the player can purchase for coins. The music for this board is a remix of the main theme of Super Mario Bros.. Coin: The player obtain 1-3 more coins. Super Mushroom: The player becomes large and steals 2 coins from each opponent while going around the board. Mega Mushroom: The player becomes huge and steals 2 coins from each opponent, collecting 8-10 more coins while going around the board. After landing on Event Space, the player gets a chance to buy one of the Special Dice Blocks for certain amount of coins. An image from the Japanese website showing how the power-up stand works. Getting a Star on the board. This page was last edited on May 28, 2018, at 20:29.